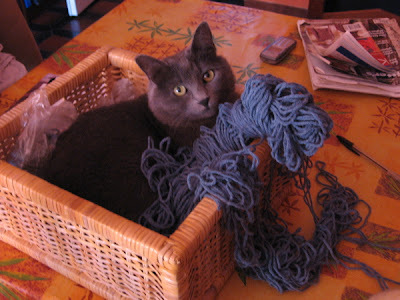 Yes, that's one of my two Roman cats, Betsy, enjoying the spectacle of me cleaning out my knitting basket, which for the past 4 years or so has served as nothing more than an occasional cat bed for her. No, this isn’t a crafting blog and I’m not converting it into one. However, I do knit and for a while I’ve been itching to do a post that combines my love of knitting with my love of Rome. So indulge me, will you, just this once? Or, all you non-knitters out there can join me back on my next post. Truth of the matter is that should you find yourself living in Rome for any extended period of time, and should you be interesting in knitting during said time, you’re not really too much in luck. Knitting, although popular in the States with twenty/thirty-somethings and up, here in Italy is still seen as a sport only for le nonne, the grannies. Which is fine, unless you are one of those non-granny people of any age who has the urge to knit. 1) Yarn shops aren't that easy to find. 2) The few shops that I’ve managed to find generally don’t display their yarns like you find in other countries (my personal examples are the US and a shop I visited in Sweden where the yarns and projects are on display for customers to browse). No, here in Rome you probably have to stand in front of a counter to look at yarns displayed on the wall behind, and ask for each individual ball of yarn. Perhaps if you're lucky you can see a sample strand or ball of yarn, but nearly always under very close supervision. Pretty tedious. I learned how to knit through a class I took when I lived in Phoenix about six years ago. Once I started my life here though, things were so hectic I had no time, and certainly no money, for hobbies. I put away the knitting stash and there it stayed for years, half-finished projects becoming no more than a cozy bed for Betsy (the only one of my two cats still "small" enough to squeeze into the knitting basket). Yes, it's clear from the photo that she was heartbroken by this sudden destruction of one of her many sleeping spots. 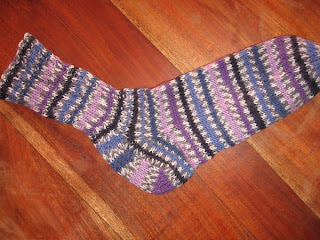 A forlorn sock, the first I ever attempted, whose mate was never completed. And now I can't find the pattern I used for it. A miniature “sweater for your head” project with lots of cables: I finished the first “sleeve” of the hat and it had four cables which ended up being so incredibly time-consuming for something so tiny that I never started the second sleeve. So now we have the rare prototype of a one-sleeved sweater hat. While I haven’t gotten around to completing either of these projects, I did make a regular "dumb roll-brim hat" for someone as a Christmas present with some angora yarn I bought in Stockholm. I ran out of it about 3/4 of the way through, and was faced with the dilemma of buying yarn here in Rome to finish the project. I went to “Lana Gatto,” a beautiful yarn boutique, but I ended up feeling like Julia Roberts in Pretty Woman when she goes shopping for her fancy-shmancy clothes. There were three severe-looking shop assistants dressed all in black, staring me down as I looked at the yarns. Way too nerve-wracking. I asked for the yarn I needed, tried to browse for a while but eventually just bought my yarn and left. They made me feel so uncomfortable! It’s a shame, because they have a pretty nice selection. Check out the two women dressed in black with their arms crossed. And this is before I even entered the shop. I've never seen any other customers in here. Hmmm, wonder why. 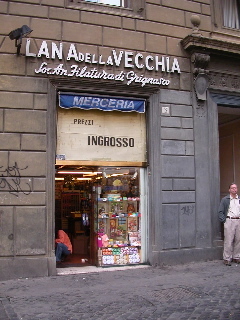 The second shop I can advise you of is called “Lana della Vecchia” near Campo de' Fiori. The photo below is from Unraveling. I've stopped in here once, and while small, it has a good selection and there were so many other women at the counter that the saleslady didn't have time to stare me down or make me feel uneasy. I think I'd go back here if I needed some yarn. At Unraveling she mentions their sign which says “wholesale prices” and bought 100 grams of cashmere for €53, which must be a good price although I'm no expert on these things. It’s the equivalent of nearly $70 USD. Thanks to another traveling knitter named Yuvee, I can add to our list a shop called Filati Filpucci, in her words, “… run by men and looked more like a hardware store than a yarn shop.” Interesting, no? Stop by her post to discover other shops in Italy, as her travels took her to Florence as well. 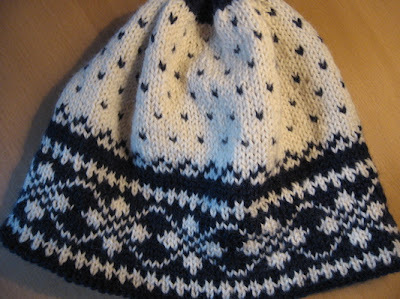 I've been lurking on her blog for a while now..she's a very proficient knitter. I’m molto impressed by her skill in seeking out gorgeous yarns, braving the shop owners, and without any Italian to boot. Brava! She encountered the same thing I describe though, the whole “look but don’t touch” phenomenon and the insistence on one-on-one service. Not what we knitters are generally used to. I personally visited Filpucci after reading about it on Yuvee's blog. Yikes. She wasn't kidding, folks. It was so bizarre. You enter and there's a looooong counter with two young (late 20ish) guys who look like they would be just as at home in a mechanic's garage, but yet are dealing with all these grannies buying yarn. They've got a ton of stuff, but I was really put off by the signs all over the place, literally in front of every single type of yarn, saying that you absolutely, positively couldn't touch anything. Lame. Won't be going back. Although I salute Yuvee doubly now, because I even speak Italian and didn't want to brave that madness. Knitters visiting Italy, I have a secret to tell you about, and most unfortunately it is not in Rome. When visiting my friend Eugenio a couple weekends ago, I mentioned that I like to knit and was informed that Biella, where he lives, is pretty much the yarn and textile capital of Italy. What? I didn't believe it until he called up his mom for advice on where to get yarn, and then took me to a store that seemed from outside like an anonymous little hole-in-the-wall. Turns out it was none other than the factory store of Lana Gatto--remember the place with the scary sales ladies? Need a hint? Well, consider that at Lana Gatto in Rome, I paid €6 for two. In Tollegno I paid €11 for the whole bag. It's not factory seconds, either. It's just that buying at the source is cheaper. They sell by weight, and the price is displayed like prosciutto: € X per 1000 gr. They had boxes upon boxes of precious cashmere stacked high to the ceiling, and it was €330 or so per 1000 gr. When you think back to Unraveled's purchase, well, you can see that it's really something. Her 100 grams here would have cost just about roughly €33, about $43 USD. Knitters in Rome and knitters visiting Rome and Italy, unite! If you have any shops to add to the list, or shops in other cities, please add them in the comments. Lana Gatto looks beautiful but I am having a hard time picturing Pradaish wearing salesladies at a yarn shop! I used to knit but haven't done it in years. It's still a big "trend" out here. Nice work!The hat you made looks comfy and warm and stylish. nice hat, I'm impressed ! I think I've found my future knitting-teacher !! oh, by the way, I just love your cat, she's cute !!!! I had a knitting phase last year. I only managed scarves though. Scarves of all lengths and colours, but *only* scarves. This year I haven't knitted anything - what a waste of talent. You're quite the talented knitter! I haven't dared myself to knit Fair Isle yet. It's coming though. I would hate to not be able to freely browse through yarn. I have to be able to examine it, feel it, turn it in the light. It would be worth it to me to make a weekend trip to buy yarn at the factory outlet. I'd just buy me enough to last me for six or eight months! I prefer to knit socks and luckily sock knitting is very popular in Germany. I have a wide variety of yarns to choose from - which is bad for my yarn budget! Your cat is so pretty. The next time you need "Lana del Gatto" just give her a quick shave! Hehehehehehe! Loved the photo of the evil sales women! 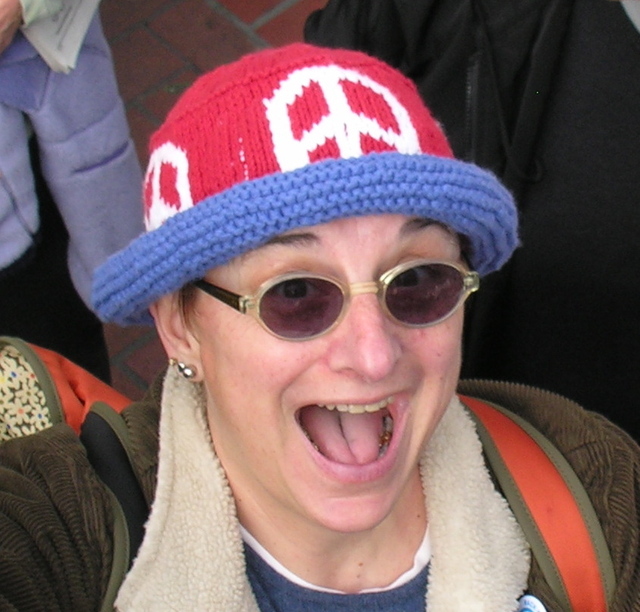 I tried to learn to knit a few years back, but was never any good at it. Maybe I should take a class the next time I am State side. 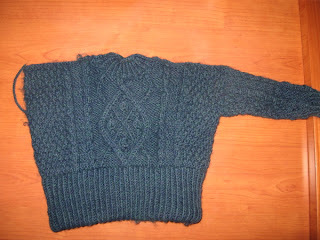 I've never knitted but I came close to attending a knitting group last weekend in Milan - and then we went to Puglia. Boo. Yay? I would like to learn though, it might be fun! I want to make a hat, too. Maybe Jessica has some pointers. 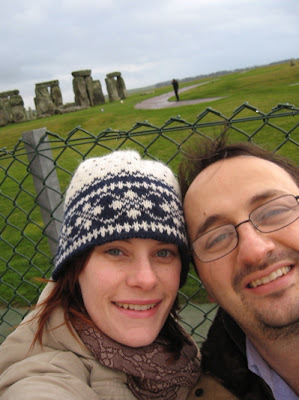 I love your blog covering two of my loves in life; Roma and knitting! 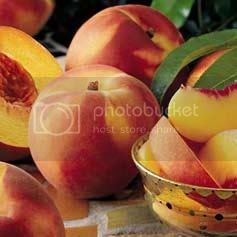 The two stores that you mentioned are the only ones I have found in Rome, with the exception of some general housewares stores that carried yarn of dubious distinction (polyesters in ghastly colors). 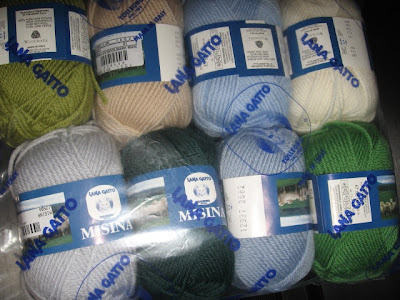 I ruffled some Italian retailer feathers in Lana Gatto by going into the drawers underneath the displays to find more of one of the yarns on the shelf...definite faux pas (sorry, I can't remember the Italian equivalent of this expression). I think I had stunned them in the first place by being one of the few males that ever ventures into their store. I love messing with convention!!! 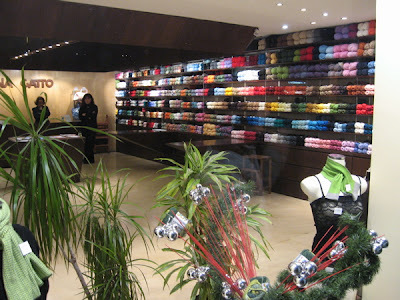 By the way, I did find another yarn store on the outskirts of Rome, which I would go back to if I could remember its name. My partner and I were taking a little train from Termini to go to Castel Gandolfo, and we had to get off in Ciampino to make a connecting train. We had some time to kill, and the yarn store was on the main drag leading away from the tiny train station. I may try to find it again when we travel to Rome in October. Beautiful hat my dear...I too haven't tried Fair Isle technique yet...it's hard enough to hold yarn in one hand without stranding in two hands. NYC: I know, isn't it crazy about those women? Please! You're selling YARN, for God's sake!! J. Doe: Grazie mille! I love the hat, it even has a cotton lining so it's not scratchy. Isabelle: We will definitely have to start a knitting club when you get here. Kel: I would love to teach you, if only I lived closer... it's way easier than it looks, promise! Delina: Actually the sock is for a size-10 footed women, me! ;-) I can't even buy shoes in Italy for my big feet, che vergogna! Dixie: Thanks! I know you're a sock knitter too. Cyn: You're joking but you know that Ale made a funny face the first time he heard Lana Gatto... I don't think he wants to admit that for a split second he thought it really meant "cat wool." Too funny. John: Great story! Male knitters are a rare and wonderful breed. Have you stopped by Brooklyn Tweed? You should start a blog with your projects, too!!!! Maybe I'll check it out next time I come home. Hah! What a nice little review of kniting in Rome. By the way, that's Mr. Celia standing next to Lana della Vechhia. In 2001, my one-month "Roman Holiday" to take a break between jobs in the US and study Italian in Italy became a way of life after I fell in love with both this city and my husband, who I met the first day I arrived. (It happens when you're not looking!) After stints teaching English as a second language and directing a US university study abroad center, I moved back to the States for 3 years, had three kids, and eventually came back to Rome. Looks like I'm here to stay. 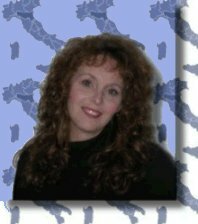 Join me at my new blog, unamericanaaroma.com.